There once was a pirate king named Frankie. He paid some dubloons to get a map of the treasury. He summoned all his crew and set forth to the city. To steal the guard's key to unlock treasures of man. One guard found of the pirate king's identity. And booped his head to keep his vocal chords barred. Stealing a precious cargo of hotdogs and beef. We know we aren't always there to send you our paws and prayers, but we truly hope you're all better now, Frankie--for life, for good. Cheers to our Bloggyville Community. Cheers to Frankie's Day! Hugs to you all, dear friends! This wonderful post made me hungry for hot dogs and beef! Thanks for adding verse and merriment to today's fun! I know Frankie must be wiggy-wagging with delight at how many friends are showing pirate spirit! Fantastic post!! We still have cake and grog left from today's celebration so come and by and help yourselves. ps.....there's still time to send a pic of you with your Dad for our belated Father's Day Smiley Box. The deadline is tomorrow..
Great poem. We're sure Frankie will LOVE it! We're happy his eye problem was just a tear duct problem and can be controlled! Hahaha! 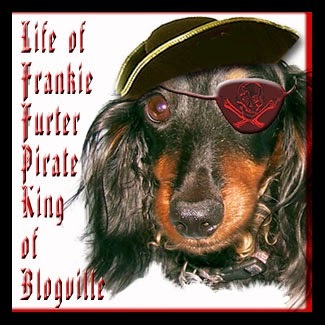 Do you think Pirate King Frankie will share his loot of hotdogs and beef? Having the key makes life a lot easier. Great one for Frankie! 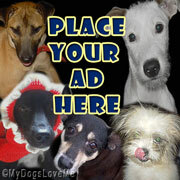 An'thank-u fur stoppin'by our bloggie - yep, we iz all better now.